Heat olive oil in large pot over medium-high heat. Add garlic and cook just until garlic begins to sizzle. Add corn and peppers and cook about 5 minutes, stirring occasionally. Add stock, Pinjur (or other tomato-based sauce) and chicken. Stir well and season with salt & pepper. Bring to a boil, then add eggplant and zucchini. Reduce heat and simmer until vegetables are tender, about 5 minutes. Remove soup from heat and stir in scallions, oregano and basil. Vegetarian or vegan? 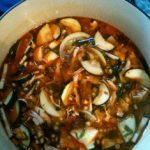 Use vegetable stock and skip the chicken.